Most of the important controls for working with loops appear in the top right of the Impact XT panel. It's possible to change these settings for multiple pads simultaneously. While reviewing PreSonus' Atom controller recently, I spent some time digging deeper into the less obvious functions of the Impact XT sampler. One area I hadn't previously explored so much was using loops rather than hits or kits. 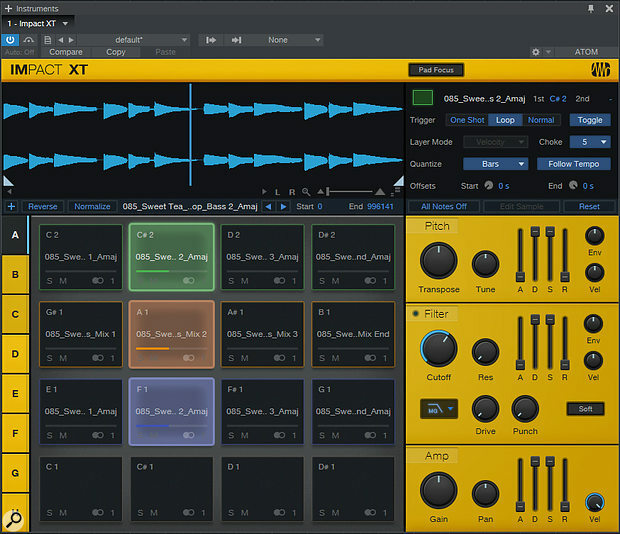 The combination of Atom and Impact XT lends itself very fluidly to playing drum samples and recording them into patterns, but it turns out that once you start playing with loops, Impact XT enjoys a whole new relationship with your hardware controller. And you don't need to be an Atom user to appreciate this — it will work with any pad controller, keyboard, or even just the mouse. Through a bit of manipulation of the quantise and choke functions, you can build a loop arranger, clip launcher, or whatever it is you call the system that lets you fire off loops and clips in an Ableton Live style. You can stack loops up or layer them across the pads, set up banks for verses and others for choruses, and lay out an entire song like you're using a rather cramped, 4x4 Push 2. And then you start to discover that Studio One and Impact XT have unexpected potential as a live performance tool.